The PCG spent a day in Bruges and another in Brussels making it into the local news in both. Unsurprisingly, what with Brussels being the ‘congestion capital‘, Bruges in West Flanders was by far the more bike friendly of the two. I stayed on for the rest of the week in the ‘venice of the North’ and like the riders in the Hell of the North I’d had quite enough of high pressure tyres on cobbles by the end of it. Had I stayed any longer it would’ve necessitated a hybridised version of a Brompton with Moulton suspension. Thankfully it’s something that the teams in both places are looking for solutions to: replacing them with tarmac isn’t an aesthetically acceptable option in most instances but having the cobbles cut with a flat face during manufacture is. If you’ve spent some time roaming round the british rail network you’ll have come across the yellow New Measurement Train. 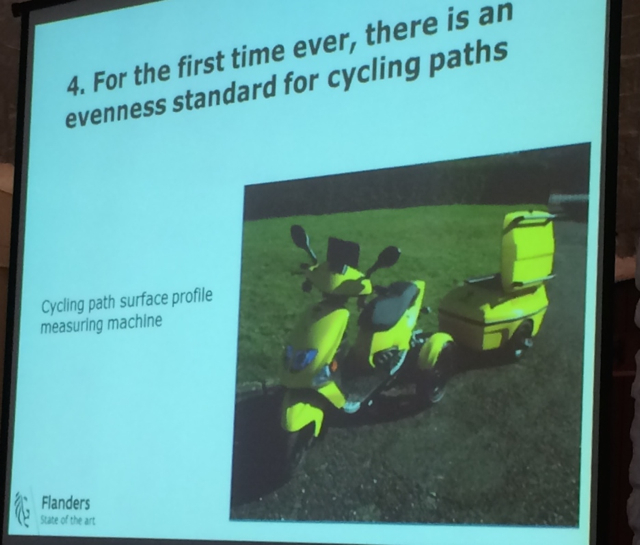 Flanders has a yellow measurement bike. If there’s one thing that says the Flemish are taking the quality of their bike network seriously this is it. I rode NCN 81 along the Birmingham Canal over Easter and I reckon, in common with many inclusive bike users and disabled cyclists, it’s touch and go whether this measurement bike would actually be able to access some of it let alone ride along the path. Which begs the question: When are Sustrans getting one? From my notes: Flanders has a population of 6 million people, a total transport budget of €3bn, of which €1bn is for roads and €100m is for cycling. On the back of my fag packet that equates to €17 per person per year on cycling or 10% of the roads budget. If I’ve got those figures right that’s a healthy level of funding. They’re committed to ‘vision zero‘ in order to eliminate deaths by 2050 and they’re very proud of their bridges over major highways and junctions, one of the local ones being the focus of the local news piece. 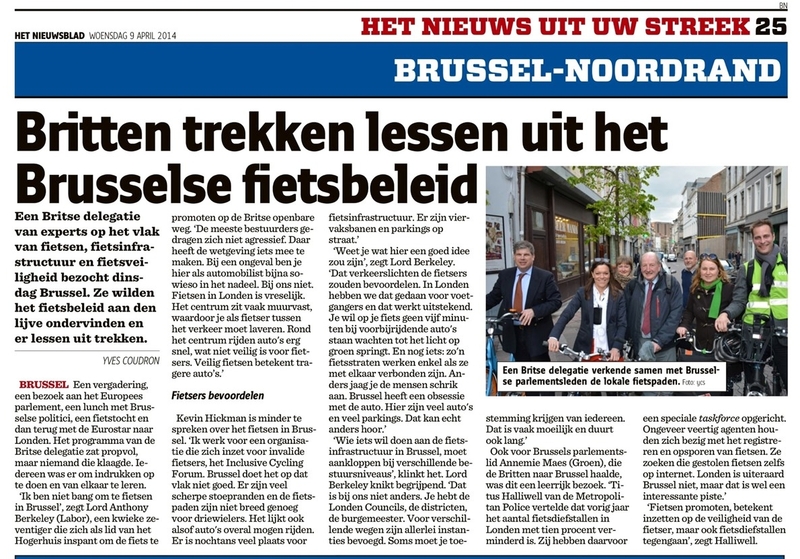 Flemish minister for Mobility Hilde Crevits (CD&V) and Bruges Mayor Renaat Landuyt (SP.A) have taken representatives of the British Parliament on a bike tour of Bruges. 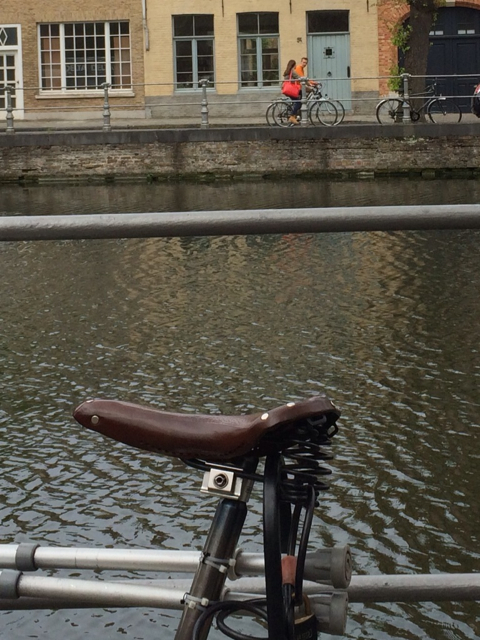 The British crossed the Channel to see Flemish cycling culture with their own eyes, for while the residents of Bruges aren’t satisfied with their own city, for the British Bruges is an example of bike friendliness. 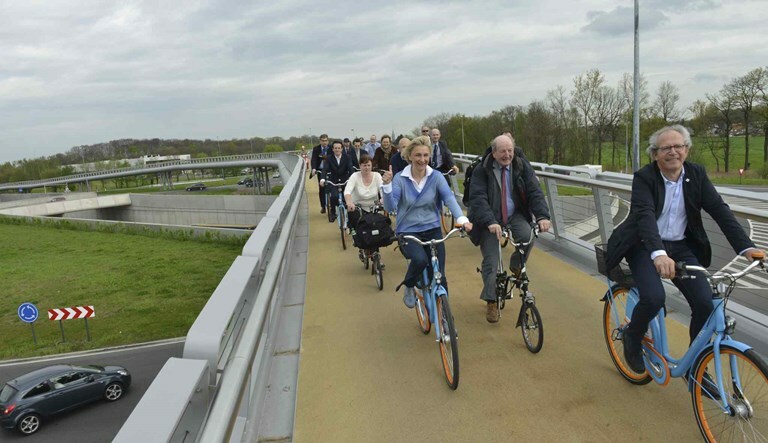 ‘We don’t have such a bike bridge as yours in Great Britain. However it wouldn’t be out of place in for example London’, says Tony Berkeley, who strives for better infrastructure for cyclists in his own country. After a trip across the forked bike bridge over the motorway, the British rode for an hour or two around the Bruges roads and paths. The conclusion is clear: here you can cycle far more safely than on the other side of the Channel. The bridge itself cost €4m causing some discussion amongst the british delegation as to how much more such a project was likely to cost in the UK and whether the relative headline figures for such projects can be true like for like comparisons across countries. Looking at Google (compare current map with old satellite image) you can see the old crossroad layout has been reconfigured into a roundabout and an underpass in addition to the new three armed bike bridge floating over the top. Having spent the rest of the week there and using the bridge to get to a lovely little coffee stop in the woods adjacent to it I can say there’s still some work to do – there’s no crossing at the end of the southern arm to access the bike path into Tillegembos. However, West Flanders has a plan, continuous investment and a consistent policy; surely it’s just a matter of time. Because of a department name change I’m not sure if Hilde Crevits the Flemish Minister for Mobility (isn’t that so much more descriptive than ‘transport’?) has been responsible for transport for 5 or 7 years, but either way it seems stability in terms of people has been beneficial. In fact there appears to have been a ‘Total Bike Plan‘ since 2002 and this video shown as part of the presentation in Tillegem Castle sums up Flanders’ current ambition. 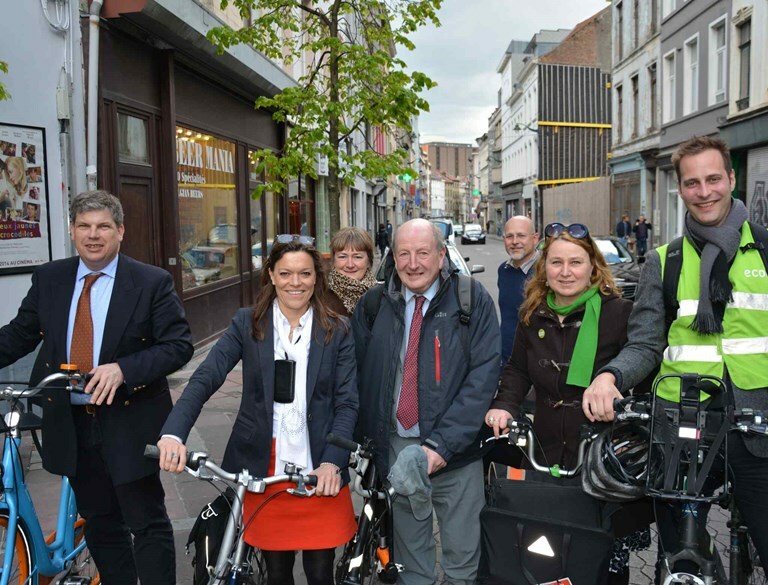 A British delegation of experts in the fields of cycling, cycle infrastructure and cycle safety visited Brussels on Tuesday. They wanted to experience the cycling policy first hand and draw lessons from it. Brussels. A meeting, a visit to the European Parliament, a lunch with some of Brussels’ politicians, a bike tour and then back to London on the Eurostar. The British delegation’s schedule was packed but no one was complaining. Everyone was there to form an impression and learn from each other. ‘Do you know what would be a good idea here?’ says Lord Berkeley. ‘That traffic lights should favour cyclists. In London we’ve done that for pedestrians and it works great. [Struggling with this next one] On a bike you don’t want to stand waiting for five minutes with passing cars till the light turns green. And another thing: bike routes only work if they are joined up. Otherwise you just scare people. Brussels has an obsession. There are lot’s of cars and lots of parking here. That can really be different. Promoting cycling means beginning with the safety of the cyclist, but also combating bike thefts’, says Halliwell. I dare say a few things were mangled by the journey to and from another language but you get the drift. Worth mentioning that the picture was shot outside the lunch stop Beer Mania which I heartily recommend and is in some part responsible for the smiles. We discovered on the bike tour that Brussels is friendlier to cyclists than it used to be thanks to many smallish interventions, mostly paint based I think it’s fair to say, so it was heartening to hear Annemie say this was only the first phase, suggesting there is better to come. There are some pedestrianised areas but one thing which struck me is that despite the extensive use of one-way streets, filtered permeability for bikes appears to be absent in Brussels. Which leads me to suspect that the numerous one-ways are there to cope with the amount of on street parking rather than to control traffic flow. Unless I just managed to miss them all I think a lot could be achieved with a lorry load of bollards. We did fit a lot in, particularly during our day in Brussels, so I’ll round this up with my own impressions of what was an enjoyable an interesting study tour. 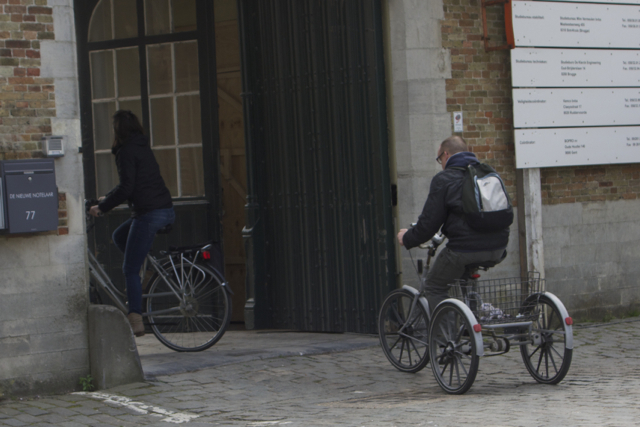 Many similarities with the UK in Brussels while Bruges felt like it was closer to a dutch level of bike friendliness. No surprise there. There were visionaries and there were pragmatists. The visionaries seemed to dominate where the cycling felt good and the pragmatists where it felt stressful. I imagine that’s more an effect than a cause but I do wonder where the tipping point might lie. I came away with the impression that the ECF, using Brussels as an example, is currently putting an emphasis on achieving modal share gains cheaply. I think that’s fine if there’s no money so long as it doesn’t hamper the efforts of those trying to secure funding for better and more inclusive solutions. We wouldn’t want to leave yet another cohort of youngsters without an independent means of transport. If the champions of cycling don’t value cycling in hard cash, who will?